Stainless Steel is necessary for many applications - especially those in corrosive or high temperature environments. Stainless Steel alloys offer varying degrees of corrosion resistance, heat resistance, and ductility. Please see the materials page for specific information. Smalley’s unique manufacturing process allows us to offer alloys such as 302 and 316 stainless steel from stock. 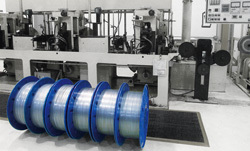 Smalley’s Edgwinding process, also known as The No-Tooling-Cost™ Process, eliminates the scrap produced from conventional stamping manufacturing processes. By vertically integrating every step of manufacturing, Smalley is in a unique position to produce Stainless Steel Retaining Rings and Wave Springs quickly and economically. Over 10,000 standard parts are in stock in carbon and stainless steel. Free samples are available. No-Tooling-Costs™ on customs; .200" to 120"